Starting defensive lineman Folorunso Fatukasi, tight end Tommy Myers and quarterback Bryant Shirreffs, reserve offensive lineman Kyle Schafenacker and Will Rishell, who is competing to become UConn's starting kicker, are among 952 players honored by the National Football Foundation for having already earned their degrees before their final college football season. Fatukasi, who has started 23 career games and enters his senior season with 125 tackles and 10 sacks, was named to the preseason watch lists for the Outland Trophy, Nagurski Trophy and Wuerffel Trophy. Myers has 27 career receptions and has been used mostly as a blocker especially during the 2016 season. 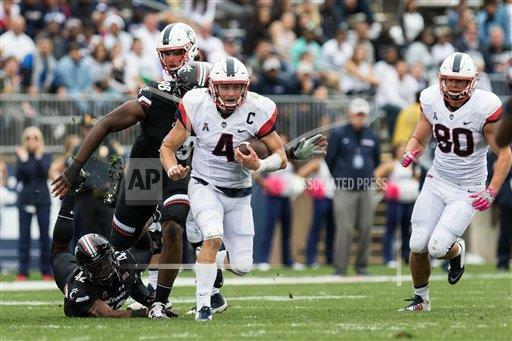 Shirreffs ranks in the top 10 in UConn history in career passing attempts, completions and yards as well as being 83 yards shy of becoming the fifth Husky with at least 5,000 yards of total offense. Schafenacker appeared in nine games during the 2016 season while Rishell is a former walk-on who is competing with Michael Tarbutt to be the No. 1 kicker following the graduation of Bobby Puyol.